Wieser precast steps are the permanent solution for any entry need. Whether it’s the finishing touch on your new home or the replacement unit for a worn and dangerous stair, WIESER PRECAST STEPS has the perfect solution for you! Wieser Precast steps are expertly cast with reinforced, high strength concrete. Their practical and pleasing design enhances any building entrance and improves property values. 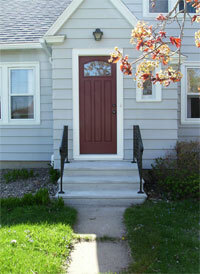 Wieser Precast steps are a beautiful and durable addition to any home, mobile home, or commercial building. Wieser Precast steps are manufactured in our plant to exact measurements and standards. No painting or treatment is required. Once installed, there is virtually no maintenance for the property owner. Every step in one complete selection has a skid resistant walking surface that is custom finished for a safe grip. The broomed sidewalk finish is durable and permanent. At 7” high, our risers are low enough for children and the elderly and the tread depth at 12” is comfortable for adults. Our steps meet all building codes and are VA & FHA approved. A variety of heights and widths of precast steps are available. In addition, a combination of units can be positioned together for extra width, height, embankment stacks, or unusual entrances. This flexibility makes Wieser precast steps the perfect solution for many different situations. Ask our experienced personnel for ideas on how to solve your particular problem. Wieser precast steps can be easily readjusted, moved, or replaced if necessary. This is a big advantage over poured concrete steps. Our step installers are happy to offer a free estimate at your location. Many customers install small Wieser precast steps themselves. However, most prefer relying on our experience and special equipment for quick installations that assure your complete satisfaction. 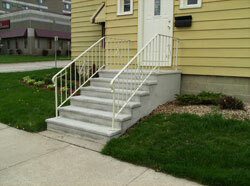 Either way, Wieser precast steps can be used immediately, no waiting for forms to be built or concrete to harden. Our fine production technique means a lower cost than poured steps. 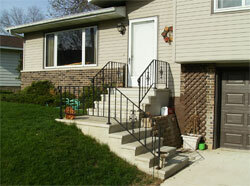 Secure anchored ornamental railings are available for all step sizes. They can also be custom made for a personal touch.